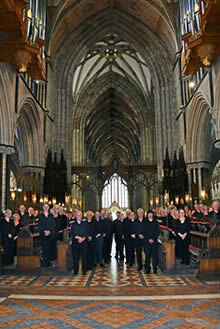 Since 2011 the choir have been making regular visits to sing Choral Evensong in some of England’s finest Cathedrals. 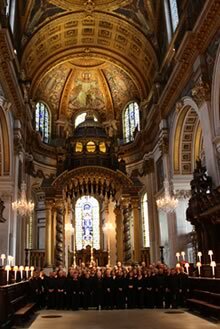 This series of visits is known as our “Sacred Spaces” series, and our first visit was planned for St Paul’s Cathedral on the eve of St Crispin’s Day (Northampton’s Patron Saint) - 25 October - in 2011. Unfortunately the Cathedral was closed a few days before our visit, because of the “Occupy London” protest taking place around the Cathedral. 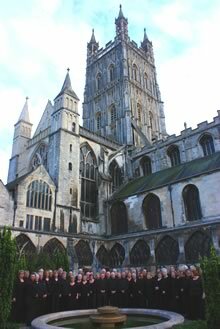 Last minute ‘phone calls were made to all Cathedrals within commuting distance of Northampton, and we were delighted that Gloucester Cathedral had a vacancy that date, and we were most grateful to the Canon Chancellor, Celia Thomson for hosting us at such short notice. The change of venue also made it impossible for our répétiteur to be with us for the allotted times, due to his other London commitments, so we were delighted to welcome the organist and composer David Bednall to accompany us. Just over seventy members of the choir took part in the visit, and we sang a set of Responses by the Organist of Cartmel Priory, Adrian Self, the Evening Service (Magnificat and Nunc Dimittis) in B flat by Henry Smart, and the glorious eighteenth-century anthem, O Lord, look down from heaven by Jonathan Battishill. 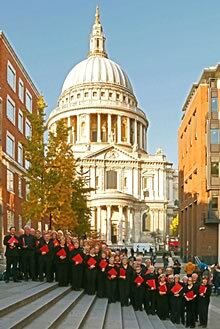 The service was such a success that we immediately contacted St Paul’s to get a new date for a visit, and on 29 October 2012 nearly eighty members of the choir sang the same programme of music in our first-planned venue! 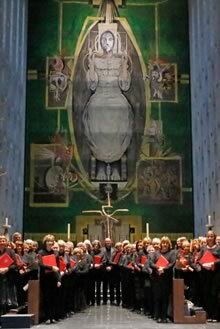 Commitments in 2013 and 2014 made Cathedral visits impossible, but in 2015 the choirs sang at not one but two Cathedrals; on 17 October they sang Choral Evensong for the first time at Coventry Cathedral, and ten days later they made their second visit to St Paul’s Cathedral. The services once again included Henry Smart’s Evening Service in B flat, but the Responses were sung to the setting by the seventeenth-century composer Richard Ayleward. The anthem sung at both services was a new work for the choir, Exultate Deo by the late Georgian composer, Samuel Wesley. Samuel was the son of noted Methodist and hymn-writer Charles Wesley and the nephew of John Wesley, the founder of the Methodist Church. 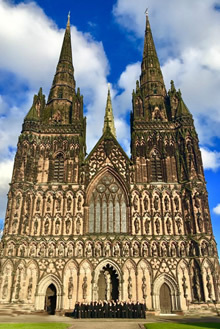 The service at Coventry will begin with a specially commissioned Introït by our Musical Director, Lee Dunleavy, setting words by Saint Luke on the Eve of his Feast Day. In 2016 commitments made Cathedral visits impossible again, but in 2017 we visited Lichfield and Peterborough Cathedral. 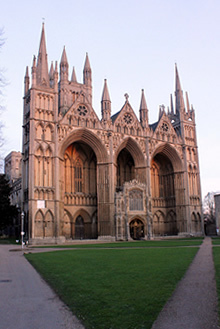 At the former we sang our Musical Director's Responses, Smart’s Evening Service in B flat, and Samuel Wesley's Exultate Deo again, and in Peterborough we joined over 250 singers for the Peterborough Diocesan Choral Festival, including our Musical Director's Responses, Walmisley’s Evening Service in D minor, and works by Mendelssohn and Monteverdi. 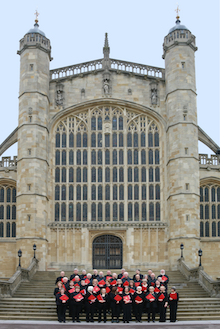 In 2017 we visited St George's Chapel, Windsor Castle - Her Majesty the Queen was in residence! - and Worcester Cathedral. At both we sang two new works alongside Lee’s ever-popular Responses. Marcel Dupré's thrilling Laudate Dominum was paired with Bryan Kelly's Latin-American inflected setting of the Magnificat and Nunc dimittis in C major, and we were delighted that Bryan travelled up from Somerset to Windsor hear us sing it. 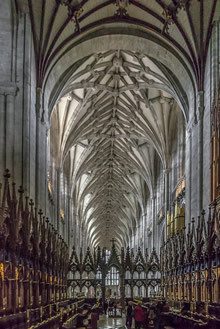 In 2019 the choir will be singing Choral Evensong for the Eve of Ascension Day at Winchester Cathedral, and later in the year at Westminster Abbey.